By 2008, the Minnesota DNR plans to increase the annual harvest of ring-necked pheasants in the state by 25 percent, and, by 2005, the DNR wants to double the average harvest, according to a long-range plan. By 2008, the Minnesota DNR plans to increase the annual harvest of ring-necked pheasants in the state by 25 percent, and, by 2005, the DNR wants to double the average harvest, according to a long-range plan approved in March 2005. The 25-page plan, developed over three years by the DNR, Pheasants Forever, and others, calls for increasing the pheasant harvest in Minnesota from its current level (360,000 roosters) to 450,000 birds by 2008 and to 750,000 roosters by 2025. "This vision assumes a sufficient habitat base to support an average fall population of three million birds. These populations would provide 175,000 hunters with an annual opportunity of more than one million days afield in pursuit of this popular game bird," the plan states. The "Long Range Plan for the Ring-necked Pheasant in Minnesota" traces the history of the pheasant in the state. Pheasant hunting prospects for 2005, according to the DNR, should be good in this area, with more than 49 birds per square mile in western Stearns County, western Meeker County, and all of Kandiyohi County. "A native of Asia, pheasants were introduced to Minnesota after native prairie grouse declined to low numbers. The pheasant is a grassland-dependent species that thrives in farmland containing a mixture of cultivated grains, grasslands, and lesser amounts of wetlands or brushy habitats," it states. "Prior to European settlement, the most common gallinaceous bird in Minnesota's prairie region was the sharp-tailed grouse," it continues. "In the mid-1800s, immigrant farmers arrived in large numbers and began to convert the prairies and wetlands to cropland. The resulting mosaic of grasslands, small grains, and wetlands provided ideal habitat for prairie chickens. Prairie chicken populations flourished through the late 1800s and early 1900s in Minnesota's developing farmland region. During the prairie-chicken heyday, Minnesota became a popular destination for non-resident hunters, who traveled from eastern states to partake in the 50-100 bird daily bags that were common during that time." "As more and more prairie and wetlands were converted to cropland, prairie grouse declined in distribution and abundance. News of Oregon's highly successful pheasant introduction spread to Minnesota. Pheasants were first stocked in Minnesota in 1905, but none of the released birds survived. A self-sustaining population was established in 1916-18 after 4,000 adults were released and another 6,000 eggs were given to farmers and hunters interested in rearing pheasants." "The altered prairie landscape (50-70 percent grain crops, with residual left in fields in winter, coupled with remaining wetlands and brushy shelterbelts) that was too intensely farmed for sharp-tailed grouse and prairie chickens proved ideal for ring-necked pheasants." By 1922, pheasants had been released in 78 of Minnesota's 87 counties. "In 1931, less than 15 years after releases of a few thousand birds, the fall pheasant population in Minnesota yielded a harvest of one million roosters (estimated population of over four million pheasants), and harvest averaged that level through 1964." "However, the population began declining in 1964 and crashed in 1965, following a devastating winter, and never fully recovered. The reason for the decline and failed recovery was a dramatic change in land use caused by new federal commodity-control and conservation programs that encouraged wholesale conversion of wetlands, haylands, pastures, and woodlands to feed-grain production and did not require adequate cover on the cropland retired under the annual commodity-control program." From 1931-1964, the average harvest of pheasants in Minnesota was 1,050,000 birds; from 1965-1986, that dropped to 270,000; and from 1987-2000, it increased back to 360,000. Ninety-nine percent of pheasant hunters in Minnesota are residents. The peak harvest was 1.7 million pheasants in 1941-42 during a time (1936-42) where the Federal Agricultural Conservation Program diverted two million acres to grass and/or legumes. In 1964, however, the Soil Bank Conservation Program, which offered long-term contracts for conservation ended. Instead, starting in 1961, the federal government retired cropland on a year-to-year basis. "To the detriment of nesting pheasants, the majority of annual set-aside fields in Minnesota were not seeded to a cover crop or the cover was disturbed during the nesting season," the plan states. "Furthermore, the new programs encouraged the conversion of many acres of hay, pasture, and wetland to crops supported by the federal program." Also, a change in farming practices over the years hurt the pheasant population, namely the switch from native hay to alfalfa, the change from small grains to row crops, and the use of pesticides. In 1985, the enactment of the Conservation Reserve Program reestablished long-term (ten-year) contracts for conservation, according to the plan. The 2002 Farm Bill expanded these conservation opportunities. "Prior to the mid-1960s, pheasant habitat was provided as a byproduct of contemporary farming practices. In 1954, small grains, haylands, and pasture formed 38 percent of the south central Minnesota landscape, which was the state's most important pheasant region. Furthermore, farm fields were small and surrounded by weedy fencerows, and wetlands were common. But, by 1997, small grains, hay, and pasture formed only five percent of the landscape, having been replaced by row crops." 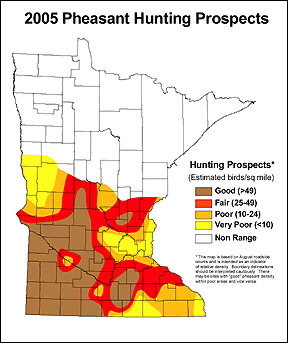 From this history, the plan concludes that: Minnesota can support higher densities of upland game birds; farming practices on private land affect habitat for pheasants and therefore pheasant population; and that increasing the pheasant population requires increasing the available habitat. Pheasants need food sources, nesting spots, and wintering areas, according to the plan. "Because most pheasants move less than two miles between summer and winter range, both reproductive habitat and at least one winter area must be available within a nine-square-mile landscape to sustain a population over the long term." Since most pheasant habitat today is due to conservation, the plan figures that to raise the pheasant harvest by 640,000 roosters (from 360,000 to 1,000,000) would require adding 2.56 million pheasants and need 2.56 million acres of habitat. To get to 750,000 roosters (an increase of 390,000) would require adding 1.56 million birds and need 1.56 million acres of habitat. This additional habitat would also benefit white-tailed deer, jackrabbits, waterfowl, prairie grouse, and other species, the plan states. Stearns, Meeker, and Kandiyohi counties are part of the central region, which has 13 counties in all (also Benton, Carver, McLeod, Morrison, Renville, Sherburne, Sibley, Todd, Wadena, and Wright counties). This region includes 23 percent of pheasant range in the state, but less than five percent is undisturbed habitat. The recent population index is 37.9 pheasants per 100 miles; at one time, this rate was five times higher. "The conservation provisions of the 2002 Farm Bill offer the best potential opportunities in 40 years to establish undisturbed grasslands. This plan describes strategies and actions to add 330,000 acres of new grassland by 2008." To reach the 2025 goal (an annual harvest of one million pheasants and a total population of four million birds) would need emphasis on conservation within future farm programs plus a dedicated source of revenue for conservation (e.g. a dedicated sales tax), the plan adds.